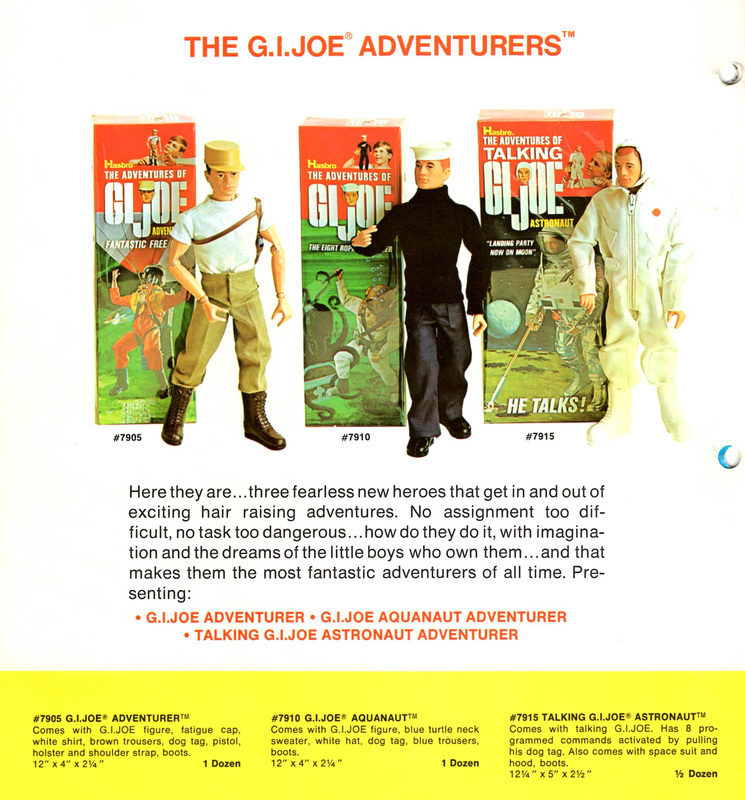 The 1969 Adventures of GI Joe series was shift by Hasbro away from the military themed sets towards a world of adventure. The basic uniforms, especially of the adventurers, still have a paramilitary flavor, but the accessory sets focus much more on civilian action. Hasbro kept their bases covered by making sure the figures had a focus, with the Adventurers covering the air and land, the Aquanaut covering the seas, and the Astronaut in space. Figures and accessories began to change a bit at this time as well. Some paint applications disappeared on accessories that were reused in sets. Figures tend to have a softer head and the mix of plastic for the bodies seems to have been slightly modified so there are fewer cracks in the bodies. Occasionally you can begin to find unpainted rivets on body parts, though this was much more the rule in the Adventure team series. Below, prototypes from the 1969 sales catalog. Note the black figure is not shown in the catalog.